*STUNNING* Completely Remodeled Ocean Front Townhouse with AMAZING Views of the Ocean and Inter-Coastal Waterway! The Beach, Pool, Tennis, Boat Ramp and Inter-Coastal are all Nearby! 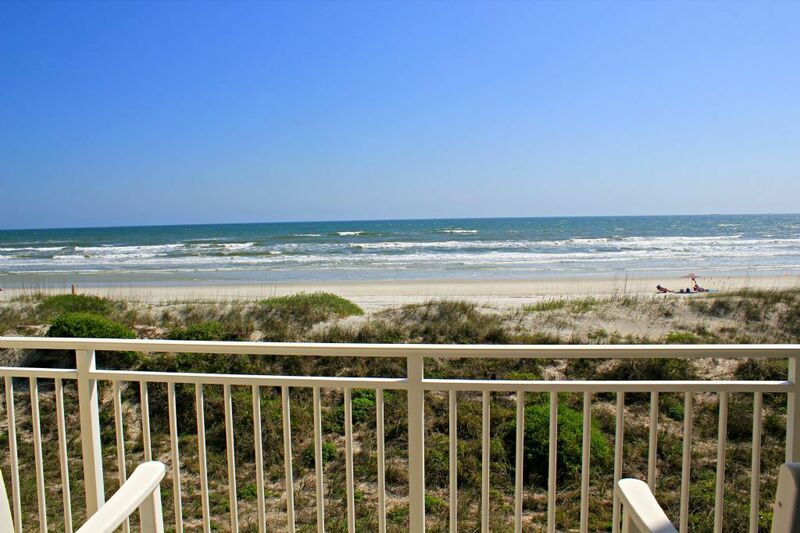 * This unit is TRULY the place for a perfect beach vacation! You have TRULY found paradise while vacationing in this GORGEOUS, completely remodeled oceanfront town home!!! No expense has been spared-from the beautiful marble counter-tops and back-splash in the kitchen, to the large "waterfall" shower heads in the baths. All new upgraded appliances will satisfy the wishes of the gourmet cook in the family and the contemporary dining table cleverly expands to accommodate 6 people. Relax in your comfortable living room sofa or swivel chairs while viewing the large flat screen TV, but you probably will prefer the amazing oceanfront views on the balcony! Enjoy your morning coffee or late afternoon beverage from the counter-high patio table and chairs, all while taking in ocean breezes and the salt air. There is also a convenient 1/2 bath located on the first floor. Proceeding upstairs, you will find the two bedrooms, each with an ensuite full bath. The master bedroom boasts a King bed, flat screen TV and more glorious ocean views! The guest bedroom has a Queen bed, another flat screen TV and it's own views of the intracoastal waterway. The elegant marble continues in both of the bathrooms, adding to the list of high-end amenities. There is also a Queen-size air mattress for extra sleeping arrangements. A huge plus is the full-size washer and dryer located off the hallway on the 2nd floor. Tradewinds is an older condominium complex just south of St. Augustine. This particular unit has undergone a beautiful remodel. Everything about the unit is first class, from the kitchen cabinets, counters, appliances and flooring. The living and bedroom areas are decorated with high end furnishings that are comfortable and fit well together. The upstairs bathrooms are small on size, but huge on quality, filled with marble, tile and glass. We have stayed at many different units in the area over the years and this was by far the cleanest one ever. We did have an AC issue which was addressed promptly, first by a complex maintenance person, then an AC tech. The issue was resolved in less than two hours total. The ocean front views were amazing and proximity to the pool, dune walk over and beach are just steps from the unit. There are zero negatives about this unit and have already referred it to friends and family. We will be back! Thank you SO MUCH for taking the time to write this detailed review! We are so glad you enjoyed your stay in Trade Winds 23 with Coastal Realty. Please let us know when you are ready to come back so we can reserve your favorite unit for you :) We look forward to seeing you again soon! Amazing! Words don't do it justice. The pictures weren't even close to showing how great the property is. The condo was nicer than expected. The only negative about the entire trip was the parking. The location of our condo left a great desire for better parking. Thank you so much for taking the time to write a review! We are so glad you enjoyed your stay in Trade Winds 23 with Coastal Realty and I am so sorry about the inconveniences with the parking. We look forward to seeing you again in the future! Thank you so much for your review! We are so glad you enjoyed your stay. Please let us know when you're ready to come back so we can reserve your favorite condo for you again! My hubby and I enjoyed 5 delightful days watching the sunrise with our coffee and taking walks on the sand. The townhouse has been remodeled with high quality materials. Great furniture, calming colors. As a cook I especially appreciated all that was available in the kitchen. Thank you so much for your review. We are so glad you enjoyed your stay and we look forward to seeing you again soon! We had a wonderful time. We loved the beach, the condo and found your company very easy to deal with!